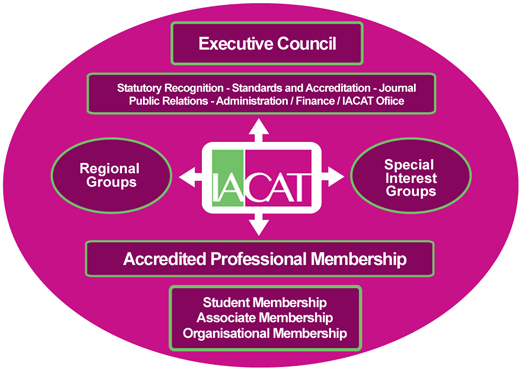 The Executive Council and its working groups focus on: Administration & Finance, Statutory Recognition, Accreditation & Professional Standards, Membership, the IACAT Journal and PR & Media Relations. The council ensures that the Code of Professional Conduct and Ethics is maintained and adheres to legislation, protocols and guidelines, ensuring safe practice for both clients and members. The Executive Council also liaises with regional groups. Ed Kuczaj is the recently retired Head of Arts in Health and Community Practice at CIT Cork. An Art Therapist, Ed has a background as an Arts and Dramatherapy Manager and Clinician, working in the field of learning disabilities and has previously served as Council member and Vice-Chair of BAAT. Louise has worked with arts in mental health for over 13 years and as an Art Psychotherapist for almost 10 years. She has worked with adults and children individually and in groups in community settings, residential and outreach addiction settings, forensic settings, with CAT trainees and in private practice. She is co-founder and Director of Artonomy, a Creative Arts Therapy organisation raising awareness of the Arts Therapies and championing for more CATs in the workplace, in a wider variety of settings, on a national scale. Maggie Dagge is a Dramatherapist specialising in trauma informed DvT. Unique to this practice is the physical interaction between client and therapist towards a mutual journey to discover the anxieties that influence and impact on a person's life. Maggie works with adults and children in both school/institutional settings together with private practice. She also runs the Irish DvT practice group. Maggie who has a background in professional theatre and venue management also uses DvT with performers, directors, teachers, therapists, social workers and trainers. Pamela Whitaker is an Art Therapist from Vancouver. Her M.A and PhD examined art therapy in relation to performance art, cultural studies and art therapy environments. She works under the name of Groundswell (www.groundswell.ie), a social enterprise that combines art therapy, arts and health, socially engaged art, and environmental activism. She is currently editor of the Canadian Art Therapy Journal. Aisling Brennan qualfied with an M.A. 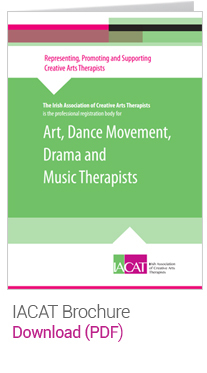 in Art Therapy from CIT/Crawford College of Art and Design Cork. She also holds a Bachelor of Education and is currently pursuing a Certificate in Spiritual Accompaniment. Aisling runs a private practice True Self, True Art in Co. Laoise. She primarily works with children, the elderly and those with additional needs. Jessica began her career as a musician studying at the Royal Irish Academy of Music performing throughout Ireland and the U.K. with orchestras and ensembles such as the National Symphony and National Concert Orchestras of Ireland. In 2010, she completed her Masters in Music Therapy at UL. Since graduation, she has provided music therapy to clients across a wide range of populations and ages including within St. Michael's House, Autism Initiatives Ireland, Bloomfield Health Services, the Central Remedial Clinic, Lois Bridges and within the Royal Irish Academy of Music. Her approach is person-centred and psychodynamic and she is passionate and committed to providing opportunities for change, hope and joy. Heidi has experience working in the mental health services for almost 10 years. These include Adult HSE/private services, residential addiction services and Child and Adolescents Mental Health Services (CAMHS). Since graduating with a MA in Art Therapy Heidi went on to study a masters in Psychoanalytic Psychotherapy, Trinity College, Dublin. Heidi presently works in private practice at primary care psychotherapy, Co.Kildare (https://www.primarytherapy.ie/heidi-morrison/). Heidi also runs weekly group art therapy sessions for inpatients in HSE mental health services, Lake View, Naas Hospital. Olivia qualified with a BSc in Psychology from Heriot-Watt University in Edinburgh. She is currently undertaking a Masters in Music Therapy in University of Limerick. For her final year thesis she will be studying the role of melodic intonation therapy in music therapy in a neurorehabilitation service. Ciara has worked across Wales and Ireland and has delivered workshops to community centres, schools and clinics and is very passionate in the work she produces with each one being unique and explicitly designed to cater to the groups' needs. Ciara currently works in the Central Remedial Clinic providing workshops to day service users and in a secondary school in South Dublin. Ciara has recently finished her masters in Maynooth University in Dramatherapy and is very excited in her future career as a Dramatherapist. Angie qualified as an Architect with a B Arch Sc, Dip Arch(Hons) Degree and has practised as an architect in Ireland, England and Germany. Angie has also worked as an Architectural Lecturer in Two Universities in the UK where she has also acted as mentor to students in the University of Suffolk.. Creatively she is a mural painter and assists Art workshops for children. Currently she has completed her first year in the Art Therapy Masters including a placement in a Deis Primary School in Leinster.